I’ve been having a bit of fun with my children creating a bookmark to give to my dad for Father’s Day. 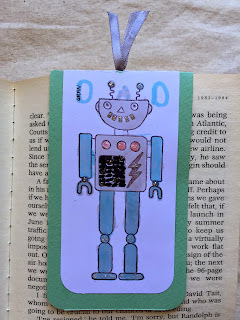 We decided that we liked Sid the Robot (a Sarah Hurley Special Edition stamp set by Clare Brown) best for our bookmark and started by stamping him at the bottom of a piece of white card 6cm wide by 23.5cm long. Another robot was stamped at the the other end of the strip so that they were facing different directions. This means that they will both be upright when the bookmark is complete. Euan and Louise love colouring and generally make a really good job, so I left them to it and got on with the rest of it. 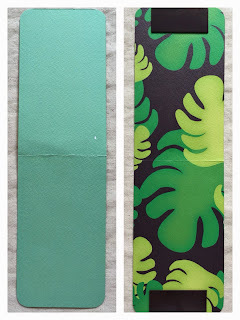 We chose some double sided patterned card from one of Sarah's A Few of My Favourite Things packs and cut it into a strip 7.5cm wide by 25cm long and rounded each corner. The centre was scored to make folding easier and I attached the magnets with double sided tape at each end of the patterned side. The magnets are optional, but I like the idea of a bookmark that cannot fall out of the book! My magnets were recycled from extremely cheap and horrible bookmarks I bought ages ago, but you can buy magnetic strips or dots from craft stores. 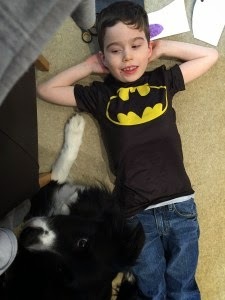 When Euan and Louise had completed their colouring, Euan round the corners of the strip of robots. We also scored the centre to make folding easier (or thinner card can just be folded in half) and punched a small hole at 3cm on the score line. If you would rather not have a ribbon tassle, you do not need to punch the hole. 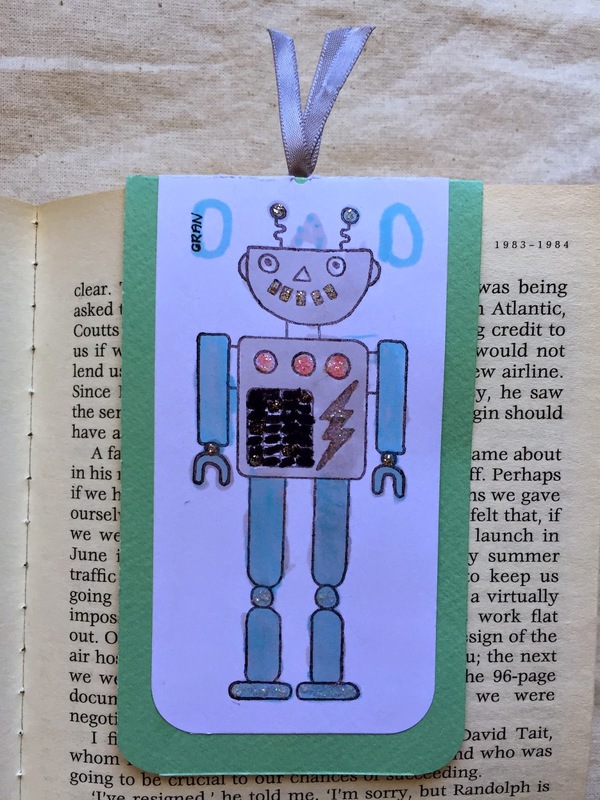 I like a ribbon, or tassle to make my bookmark obvious when it's in my book, so we selected some co-ordinating 5mm ribbon and put it through the hole, securing it with tape on the wrong side of our robot strip. We added glue to one half of our robot strip and stuck it to our coloured strip by lining up the folds of each strip and pressing the surfaces firmly together. We then added glue to the other half and stuck securely. As a finishing touch, we added some Silver and Stardust Stickles to our robots. My dad will love his magnetic bookmark, which has been created by both grandchildren and daughter with a lot of love and fun! 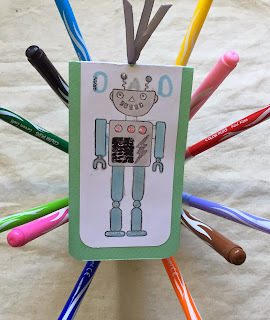 You could add a polyshrink Sid the Robot charm to your ribbon like the charms I made for my Doodle Home Keyring. A co-ordinating card, like Clare's would look great with it. And I LOVE the idea of Jaine's Promise Cards!